Bakers Dental Delicious - helps to keep clean teeth the delicious way! 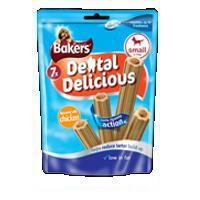 Bakers Dental Delicious - a specially shaped chewy outer to help keep teeth clean and gums healthy and a soft meaty filling to help keep him coming back for more! Tasty cleaning action! With just one chew a day, you can help keep your dog's teeth clean and gums healthy.